Years after the shoe was released, a lot still consider the 2014 model a very good Hyperdunk shoe. This includes the Nike Hyperdunk X released in 2018. One of the most well-liked aspects of the shoe is its ankle protection. Several players comment that they feel that their feet and ankles are well supported and protected. Numerous user comments say that the shoe offers consistent and grippy traction even when used outdoors. One tester calls it “near perfect” when used on clean to lightly dusty indoor courts. The shoe is durable, shares multiple reviewers. A user remarks that after using the Hyperdunk 2014 for six months, the basketball sneaker is still in good condition. Because of the open mesh areas on the shoe’s upper, the Hyperdunk 2014 allows air to circulate within the shoe. Testers and regular users love the tongue’s new shape as it provides a comfortable and formed fit to their ankles. A few reviewers appreciate the shoe’s laces, saying that they stay comfortable even when tightened and stay tied during the basketball game. The dense tread patterns on the outsole are prone to having debris stuck in between them, comments a number of testers. Several players with narrow feet find the forefoot fit to be sloppy; they recommend going half a size down. Wearers recommend the 11th Kevin Durant basketball shoe for those with narrow feet. For a few testers, traction is a little bit inconsistent with the Hyperdunk 2014 when taken outdoors or on very dusty courts. For them, the pattern performed better on clean indoor courts. The shoe needs to be broken in at first. A couple of wearers complain that the Hyperdunk 2014 was hard when bought new and even gave some of them blisters. But after a day’s wear, the shoe already felt great on foot. One wearer did not like that the shoe’s insole is glued in leaving no room for his orthotic insoles. One of the best alternative shoes would be the 6th Under Armour Stephen Curry shoe. Overall, the Hyperdunk 2014 is worth the money. Although not equipped with too much tech features, at $140, you get a solid high-top Nike performance shoe that covers you in all aspects. The shoe is a guard-oriented shoe but is actually fit for all player positions. The shoe’s ankle-protecting design is also great for injury-prone players. Most of everything is the same as last year’s model while the traction and fit were downsides… two of my most important attributes. Overall, you have a good shoe. If you liked last year's model, then you should like these. A very versatile cushioning setup... Traction can be a bit weird sometimes. Debuting on Paul George’s feet on July 16, the Hyperdunk 2014 combines one-to-one fit, secure lockdown with comfortable and responsive cushioning through the Hyperfuse upper, Flywire technology, and the targeted Lunarlon foam. Cushion. The Hyperdunk 2014 features targeted Lunarlon on the forefoot and heel area, providing the balance between impact protection and court feel. The special foam is encased within a Phylon midsole. Traction. A pressure-mapped herringbone pattern is implemented on the shoe’s outsole. The Hyperdunk 2014’s tread grooves are thick and safe to be used outdoors. However, using the shoe exclusively or mostly indoors will undoubtedly lengthen the shoe’s durability. Length and Width. The shoe fits true to size lengthwise. For players with narrow feet, it is recommended to visit your local shoe store to try on the Hyperdunk 2014 for a comfortable and snug fit. Lockdown. The shoe’s fit is assisted at the front by the Flywire that is integrated with the Hyperdunk’s lacing system. The TPU heel counter and shank provide stability and support at the back, complementing the upper’s glove-like fit. The shoe features Hyperfuse combined with open mesh in its upper. This is consistent with the other previous Hyperdunk models; however, the 2014 is known to have some bulk removed in order to make the construction thinner, lighter, and more breathable. Flywire is also implemented on the shoe’s lacing system. 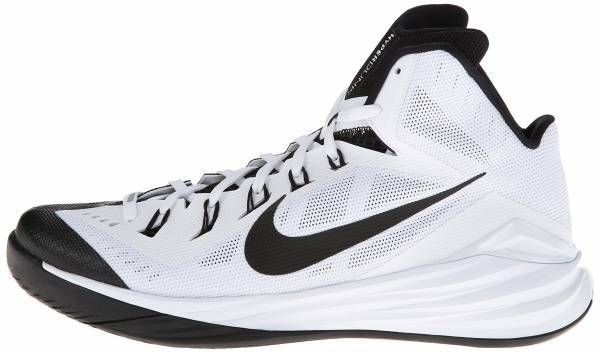 Lunarlon and Phylon and used on the midsole to provide responsive cushioning while a TPU heel counter and TPU shank are added for medial and heel support. A play on different textures is what makes the Hyperdunk 2014 an eye-catcher. The geometric shapes in the open mesh areas of the upper and the compression ribs on the shoe’s midsole give the shoe a futuristic look, while the Hyperfuse on the upper adds a touch of the classic basketball sneaker feel. Ever since its release, the Hyperdunk 2014 comes in more than twenty colorways. The basic colors of blue, black and red are available for purchase as team shoes.